The BOSU Ball is a great tool for coaches, trainers, sports teams and individuals seeking to improve core conditioning and balance. 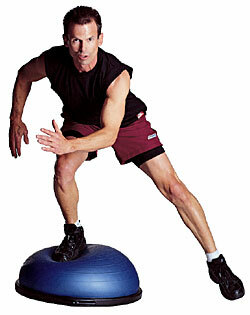 The BOSU Ball Balance Trainer is the brainchild of David Weck. His goal was to design a balance trainer that was challenging and safe for all levels. BOSU is an acronym for Both Sides Up. The ball can be used on the inflated side or flipped over onto the platform side for different types of balance challenges and exercises. By standing on the unstable surface of the half-dome ball the user will engage stablilizing muscles to find and maintain balance. As the air shifts in the ball the user constantly adjusts to the ever changing instability of the surface. The BOSU Ball challenges all abilities from beginner to advanced athlete. The ball is widely used by professional sports teams, colleges, trainers and fitness enthusiasts.